The new members of the Athletes Commission. The Namibian National Olympic Committee (NNOC) Athletes Commission held its first meeting on Friday 6th of September at the Olympic House. 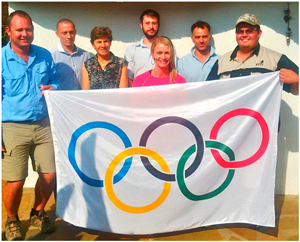 The meeting in the Windhoek suburb, Suiderhof was chaired by Gaby Ahrens, the Athletes Representative on the NNOC Board. One of the most important challenges of the NNOC is to maintain the views of athletes at the forefront of its actions. The Athletes Commission provides advice and recommendation to the Olympic Committee’s Board, representing the views, rights and interests of athletes within their National Federations. Values: Excellence, Integrity, Respect, Friendship, Unity, Diplomacy, Sharing, Inspiration. Ahrens (Olympic Committee), Michau Basson (Tennis), Francois Marais (Archery).